Hillary Clinton took to the Internet on Sunday to officially launch her campaign for president via a video posted on YouTube and on her campaign website. She then made an announcement on Twitter, setting off a social media spark. The tweet was seen 3 million times within an hour of being posted and has received over 100,000 retweets and and nearly as many favorites. Within half an hour of the announcement, Twitter mentions of Clinton reached a peak of 7,000 tweets per minute. In a time-lapse graphic, data from Twitter recorded all tweets that mentioned Clinton between 4 and 8 p.m. on Sunday. Facebook, which has the broadest reach of all social media platforms, recorded slightly over 10 million interactions -- a category that includes posts, likes, shares and comments -- related to Clinton in the 24-hour period beginning at 12:01 A.M. on Sunday, according to data provided to The Huffington Post by Facebook. These interactions were generated by 4.7 million users, and the states with the most interactions were, in order, Washington D.C., Arkansas, West Virginia, Kentucky and Illinois. 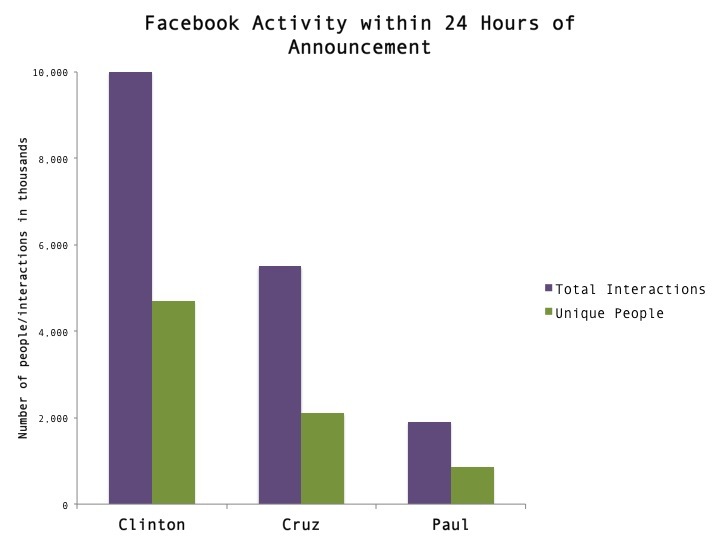 Clinton's announcement generated much more Facebook conversation than either Paul or Cruz -- even though her Facebook page, with 600,000 likes, lacks well behind those of the two Republicans. Paul's announcement of his candidacy produced 1.9 million Facebook interactions generated by just over 860,000 people, while Cruz's had 5.5 million interactions generated by 2.1 million people. In the last three months, according to Facebook, an average of 270,000 unique users have talked about Clinton each day. Thus far, her announcement video has been viewed more than 1.8 million times on Facebook and nearly 2.5 million times on YouTube. Although the data indicates a large amount of social media discussion around Clinton's campaign announcement, it doesn't capture whether those interactions were positive or negative. It does suggest, however, that the former secretary of state has high name recognition and that there is already an immense amount of buzz around her candidacy.